Still going backwards and catching up with the Online Card Class from last week. I was a little daunted by Jennifer McGuire's card at first, since measurements were involved (!) but it was amazingly simple. 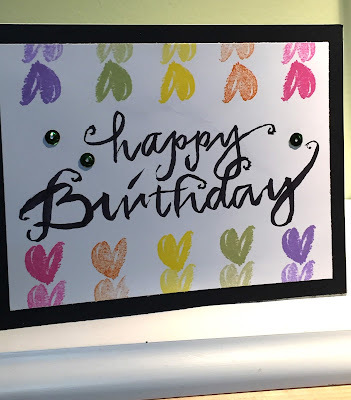 I used a combination of Gina K and Stampin Up inks to get the rainbow colors, and since I didn't have a stamp large enough to fill up the center, I decided to hand letter with a rough, old-style look to match the scribbly hearts. This card was fun and really, really fast despite measuring and penciling grid lines!